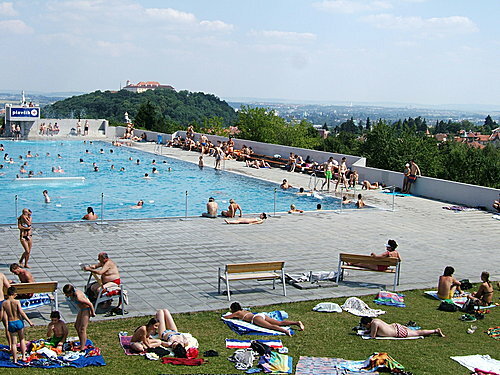 Hot hot hot summer days are back and – let´s face it – right now, very few things feel better than plunging into cool water in one of Brno’s swimming pools, lidos or natural reservoirs. Last year we have summed up all swimming places that came to our mind and now we offer you the hottest and newly updated version for your use. Feel free to share it and let us know if you have any more hot tips! Swimming pool Kravi Hora is a modern – fully renewed, with stainless pools (50m outdoor, 25m and 15m indoor) Average water temperature is 27 °C. Modern swimming pool with 3 pools: 25m for swimmers, 25m for non-swimmers with slide, and shallow pool for children with a slide. Refreshment shops available on site. Premises of the functionalist monument, „Municipal Spa“ , two pools, facilities. Mostly paved area, recently renovated. A recently renovated shallow pool with all equipment and amenities focused on children, water does not contain chlorine. Juliánovské nám. 1. Open in July + August, 9.30 – 9pm daily. Located behind the trade fair grounds along the river Svratka, it features several long pools fed with cool clean water from the river and an extensive area with grass and trees, catering to various preferences, from the noisy concrete bar area to shady quiet corners. Facilities and refreshments available. Swimming pool offers 2 pools. One for swimmers (50m) and one for relaxation with water temperature of 33°C. Services offered: Aquabar, Massages, Pedicure. Newly opened pool with various facilities on the northern edge of Brno. Open daily, one 25 m long swimming pool with 6 lanes. Possibility to take advantage of fitness and aqua aerobic activities or children´s swimming courses. There are many various lakes in South Moravia and if you’re tired of crowded and noisy swimming pools and prefer some greenery, and you don’t mind swimming in a natural lake which is not crystal clear but still clean, there are places to choose from. The Regional Public Health Authority reglarly monitors the quality of water in numerous natural lakes, so you can check it online to see which ones are OK for swimming. The most obvious place is of course the Brno Reservoir – přehrada – and we will focus on all possibilities there in more detail in just a moment. Now, some of the places which are located within ca. ½ hour drive from Brno. Before you set out, check water cleanliness here. A romantic valley in the Brno – Líšeň district. Several water reservoirs – first one is near Kadlecův mlýn (Kadlec Mill) which is over three hundred years old; the second is located below a prehistoric settlement Staré zámky and the third near Muchova bouda (Mucha Cottage). There is a small pub next to the grassy beach, mobile toilets and changing rooms. The place is accessible also for bicyclists and skaters. A traditional „First Republic“ swimming place, with modernised facilities, children’s pool, refreshments, restaurant. 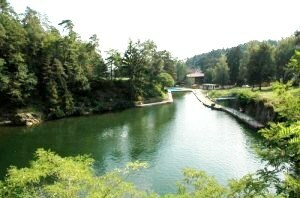 Small, recently built natural lake, small pool for children, with grass and trees around; facilities, refreshments. Three large lakes created in the 1980’s. Various places, campings, with a beautiful view of the Pálava ridge and vineyards. Merkur Camp in Pasohlávky with a separate small lake and facilities. Not to be confused with the Mušov lakes near Pálava hills! Accessible by bus or car; reservoir with facilities, children’s pool, playground, minigolf; grass and beach areas, trees; refreshments and restaurant, parking. A spectacular stony lake with very clean and cold water, also used for diving; with a view of passing trains; access by train, bus or car; no facilities. Rakovec – nearest to the tram, busy grassy areas, playgrounds, minigolf shallow entry, facilities. Suitable for children. Kozí Horka – similar as Rakovec, parking, facilities, shallow entry. Water bicycle and boat rental. Rokle – calm, grassy areas, shallow entry; further away from tram – better by boat or car, pub. Mečkov – by boat or bicycle; calm area, rocks. The „parník“, meaning „steam boat“ is actually no steam boat at all – they have always been electric, battery-operated. Thus they are quite environmentally friendly for the lake. They run from Bystrc harbour („Přístaviště“) to Veveří Castle and some even beyond, to Veverská Bítýška (depending on water level). The interval is 45 minutes. You can buy tickets right in the harbour in the newly revamped ticket office. There are also some special deals – a 2 in 1 ticket serving for a boat ride and entrance into Veveří Castle and another one to enter the ZOO. Water bicycles for two or family-sized as well as small boats are available at Kozí Horka.